Step 1. Use a light colour brown for the base of the ice cream cone. Paint a triangle on your nail, this doesn't have to be neat as we will clean it up later with the white nail polish. Step 2. 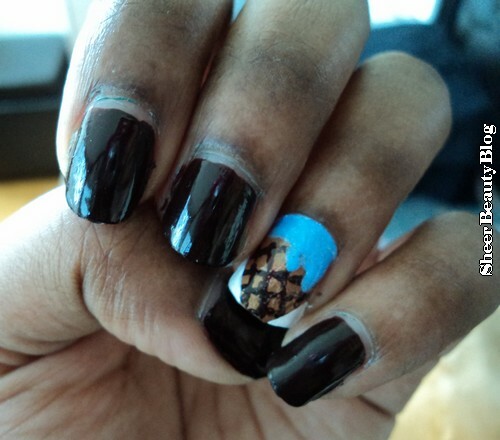 With a dotting tool or a thin brush paint dark brown lines on the cone in a criss cross pattern. Step 3. With the white nail polish your going to clean up any mistakes you made when you painted on the cone. This will also serve as a background colour. Step 4. Next start with the colour that your using for the ice cream your going to start from the base of your nail and paint down. To create the melting affect with the ice cream let a little bit of the nail polish from the brush drip onto your nail. And there you have it cute ice cream nails perfect for the summer! Your nails look yummier than ever. Very creative nail art. thanks for following me. I followed you back on Bloglovin.